You do not want to worry about hitting the little squirrels or rodents that come into your yard, but you need something that is going to give you a good target. I found that using 3D deer targets worked the best. Not only could I see where I was hitting when I made the shot, but I was easily able to aim for the areas that I would have wanted to hit when I go hunting. This is something that made my life a bit easier. Also, since I chose a 3D deer model, it was way easier to practice target shooting instead of using those square boxes that really did nothing for me. If you’re looking for something like this, I made a list of some of the best 3D deer targets out there. Choosing something that is going to stand strong against the types of arrow heads that you use, but is not going to wear down too fast is essential. Looking into all of the options available is also a must, which is exactly what I did! 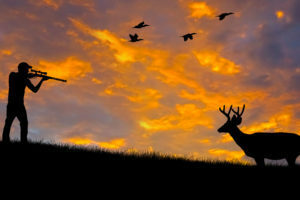 Ready to get hunting this season? Do some practice shooting on these bad boys first.